This post on the State Legislature is a part of Clear IAS polity series on Indian Constitution, covering all the important topics from Article 1 to Article 395. Posts so far published under this series are linked directly under their respective chapters and parts. Our goal is to cover Indian Constitution in detail, giving stress to important areas. We have been following the same order of Parts and Articles in Indian Constitution in our posts. After presenting the articles of Indian Constitution first, our team presents extra-information related to each topic and probable questions from the same for prelims and mains. We have so far covered till Article 167 and these posts can be accessed from the link Clear IAS Free Online Study Materials → Indian Polity Study Materials. In this post we discuss articles 168 to 177 which deals with the State Legislature in general. Article 168: Constitution of Legislatures in States. Article 169: Abolition or creation of Legislative Councils in States. (1) Notwithstanding anything in article 168, Parliament may by law provide for the abolition of the Legislative Council of a State having such a Council or for the creation of such a Council in a State having no such Council, if the Legislative Assembly of the State passes a resolution to that effect by a majority of the total membership of the Assembly and by a majority of not less than two-thirds of the members of the Assembly present and voting. Article 170: Composition of the Legislative Assemblies. (1) Subject to the provisions of article 333, the Legislative Assembly of each State shall consist of not more than five hundred, and not less than sixty, members chosen by direct election from territorial constituencies in the State. (ii) the division of such State into territorial constituencies as may be readjusted on the basis of the 2001 census, under this clause. Article 171: Composition of the Legislative Councils. (5) The members to be nominated by the Governor under sub-clause (e) of clause (3) shall consist of persons having special knowledge or practical experience in respect of such matters as the following, namely:— Literature, science, art, co-operative movement and social service. Article 172: Duration of State Legislatures. Article 173: Qualification for membership of the State Legislature. Article 174: Sessions of the State Legislature, prorogation and dissolution. months shall not intervene between its last sitting in one session and the date appointed for its first sitting in the next session. Article 175: Right of Governor to address and send messages to the House or Houses. (1) The Governor may address the Legislative Assembly or, in the case of a State having a Legislative Council, either House of the Legislature of the State, or both Houses assembled together, and may for that purpose require the attendance of members. Article 176: Special address by the Governor. (1) At the commencement of the first session after each general election to the Legislative Assembly and at the commencement of the first session of each year, the Governor shall address the Legislative Assembly or, in the case of a State having a Legislative Council, both Houses assembled together and inform the Legislature of the causes of its summons. Article 177: Rights of Ministers and Advocate-General as respects the Houses. Every Minister and the Advocate-General for a State shall have the right to speak in, and otherwise to take part in the proceedings of, the Legislative Assembly of the State or, in the case of a State having a Legislative Council, both Houses, and to speak in, and otherwise to take part in the proceedings of, any committee of the Legislature of which he may be named a member, but shall not, by virtue of this article, be entitled to vote. 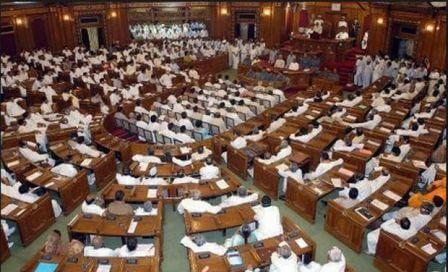 At present there are seven states which have bicameral legislature – Andhra Pradesh, Telengana, Uttar Pradesh, Bihar, Maharashtra, Karnataka and Jammu and Kashmir. The permissible strength of a Legislative Assembly (LA) is between 60 and 500. Total number of Members in the Legislative Council (LC) of a State shall not exceed one third of the total number of Members in the Legislative Assembly. Made the necessary corrections. Thanks for pointing out. Why are elections to graduate and teacher’s constituencies called indirect elections despite the direct participation of the electorate?